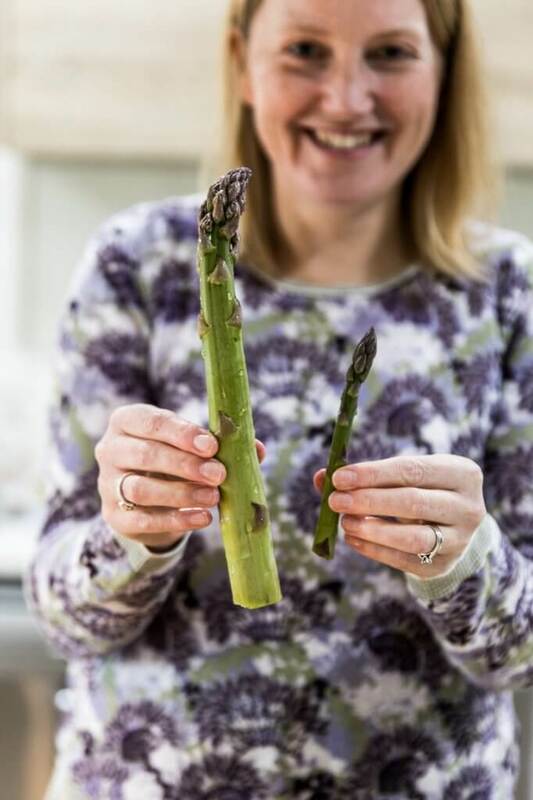 I’ve been hanging out for the new season asparagus, and watching as the first Tassie spears popped their heads up. I don’t have an asparagus bed (yet) but my generous neighbour does, and it tastes even better for being locally grown and freshly picked. 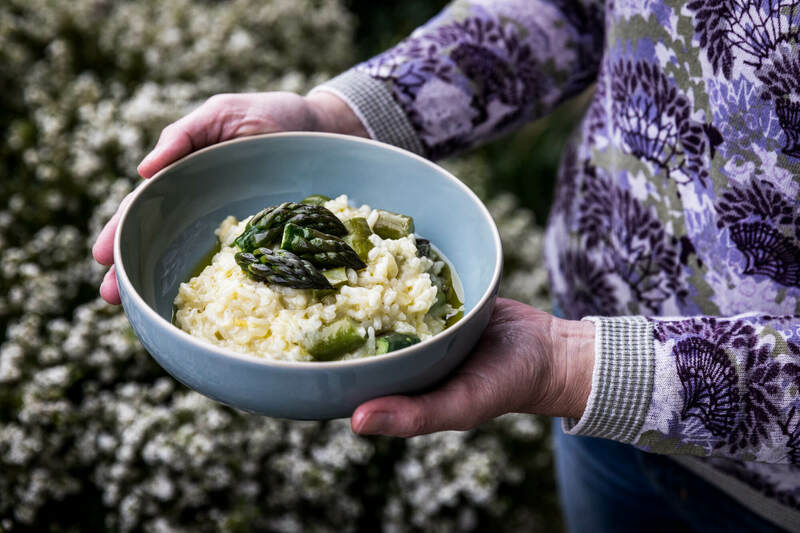 This recipe, which includes home-grown asparagus, local Coal Valley hard goat cheese and lemon olive oil, serves 4 people with moderate appetites. 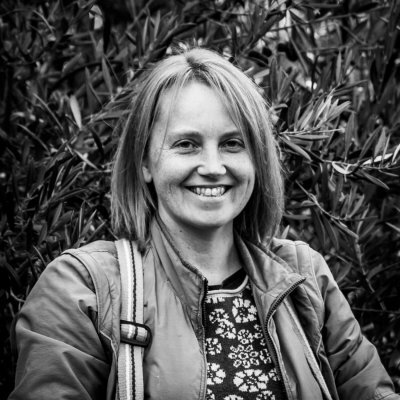 Editor’s note: Thanks so much to Chris and Keith Crook of Tasmanian Kitchen Pantry (Fi’s neighbours!) for gifting us their beautiful asparagus and for enjoying the risotto with us for lunch. 120g hard cheese, finely grated (we used half “William” hard goat cheese from Wicked Cheese and half pecorino). 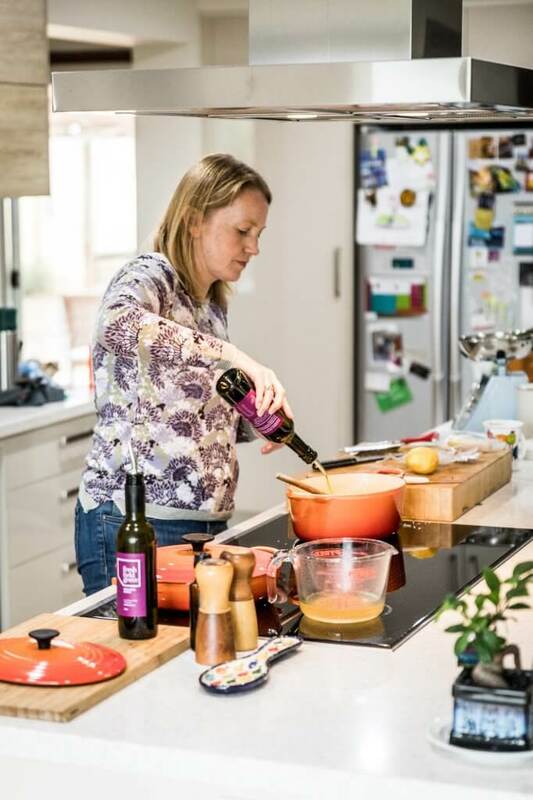 Pour 2 tbsp extra virgin olive oil into a large heavy bottomed saucepan and heat over a medium heat. Dice the onion and cook gently until translucent, about 8-10 minutes. Add the crushed garlic and rice, and cook for 1 minute, stirring frequently. Add the white wine and cook, stirring occasionally until it’s mostly absorbed. Add the stock gradually, allowing it to be largely absorbed before adding more. Leave the pan uncovered and stir occasionally. 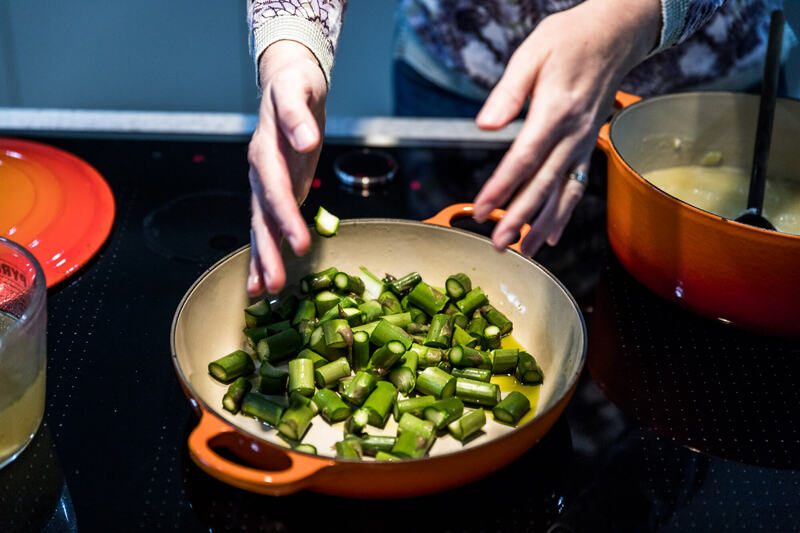 Heat 2 tbsp of extra virgin olive oil in a separate pan with a lid and cook the chopped asparagus stalks over medium heat for approximately 3 minutes. Cover and stir occasionally. 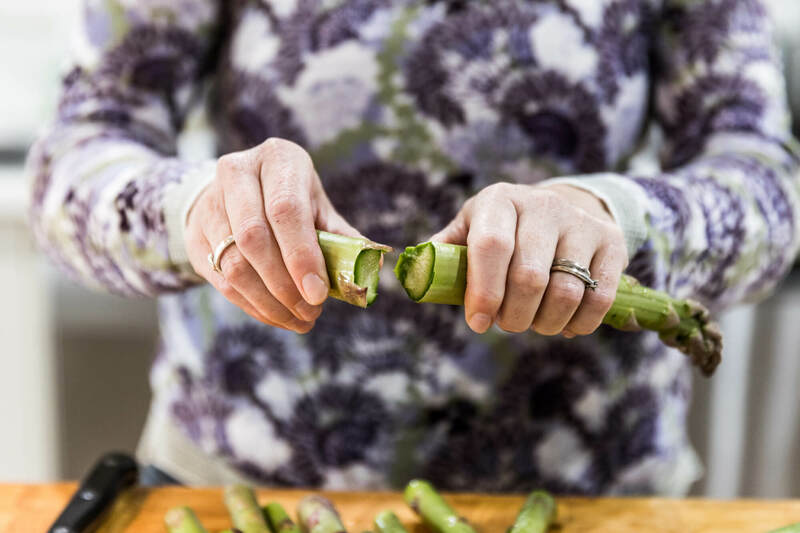 Add the asparagus tips to the stalks and cook covered for a further 2 minutes until just tender. Take off the heat and keep warm. When the rice is cooked (approximately 18-23 minutes) remove it from the heat and season with salt and pepper if required. Add the remaining 4 tbsp of extra virgin olive oil, lemon zest, grated cheese, and cooked asparagus to the rice. 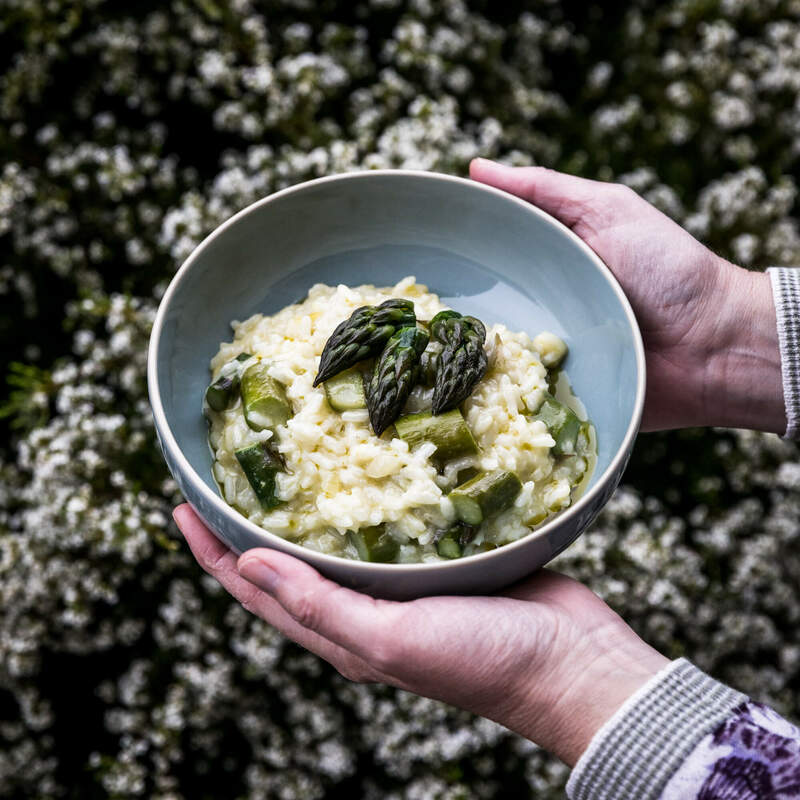 Cover the pan with a lid and leave to sit for 2 minutes, then uncover and stir the melting cheese and asparagus through the risotto. Serve into warmed bowls and finish with a drizzle of lemon olive oil. 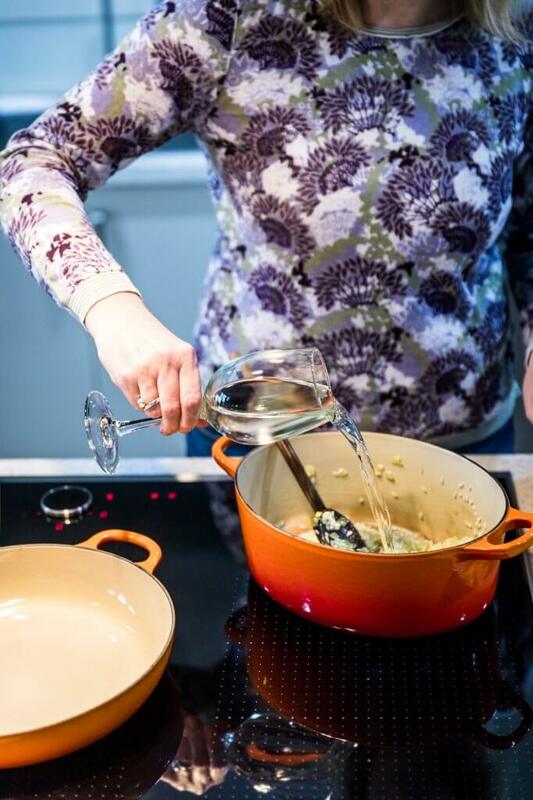 Making risotto isn’t scary. I’ve found risotto to be a lot more forgiving than I expected when I first made it! You can get away with adding most of the liquid all at once and stir pretty infrequently, or add it very slowly and stir more for a creamier texture. I’ve also found keeping the stock at boiling temperature isn’t necessary although it does help keep the temperature more constant while the risotto’s cooking. 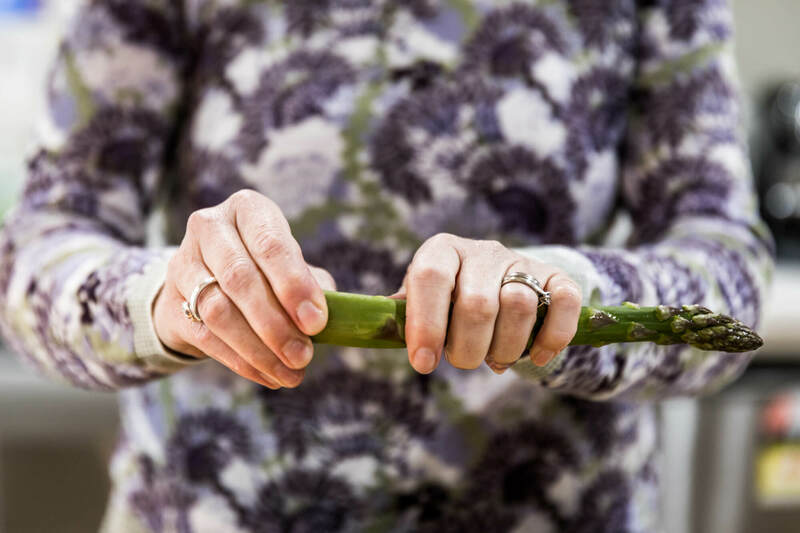 Where to buy this asparagus. 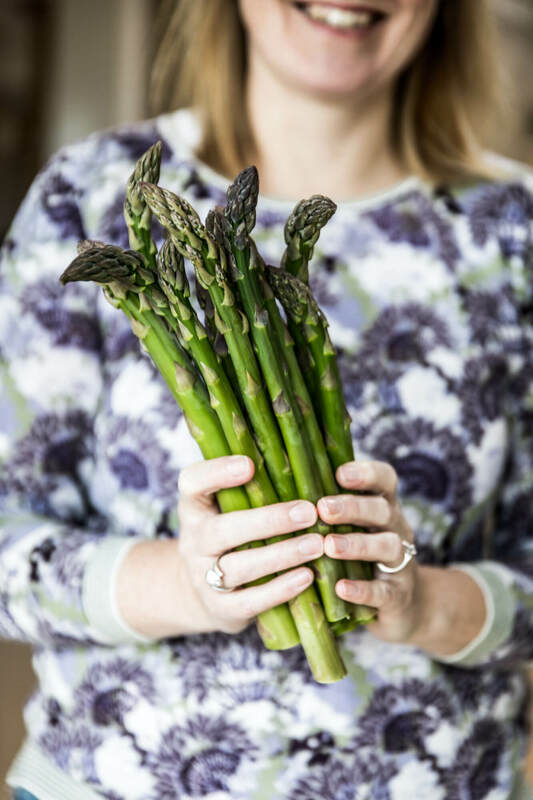 Limited quantities of home grown asparagus from the Tasmanian Kitchen Pantry garden will be available most Saturdays on the community stall at Richmond Farmers Market while it’s in season. On stock. I usually use stock cubes, but home made vegetable or chicken stock would be delicious. 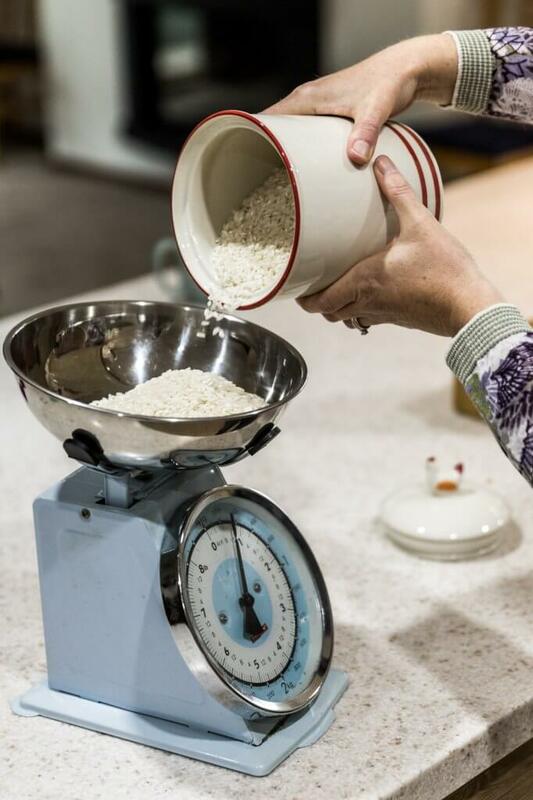 If you run out of stock before the rice is cooked use a little boiling water to top up. On olive oil. 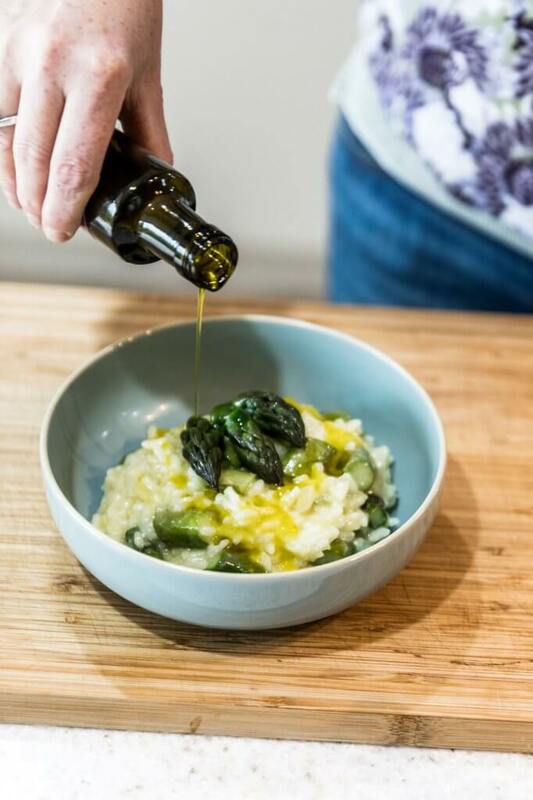 Risotto is traditionally made with butter, but extra virgin olive oil works just as well, or use a bit of both. Patience is a virtue. 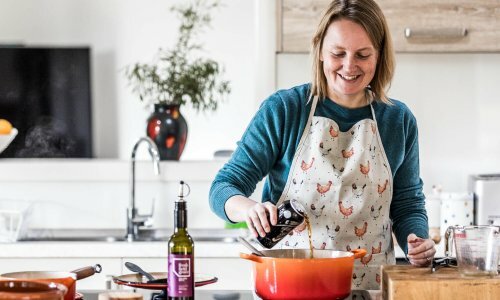 Risotto always takes longer to cook than I think it will, or the recipe says…. This may be related to my stock not being at boiling temperature! Variations. There are lots of variations on risotto. While asparagus is in season this is one of my favourites, and it’s lovely with the addition of baby broad beans. For a “straight from the freezer” version it’s hard to beat the Jamie Oliver recipe for pea and prawn risotto. And I try to keep a pack of dried mushrooms in the pantry for a minimal hassle mushroom risotto. Don’t have Fiona’s Lemon Agrumato (lemon olive oil) on hand? 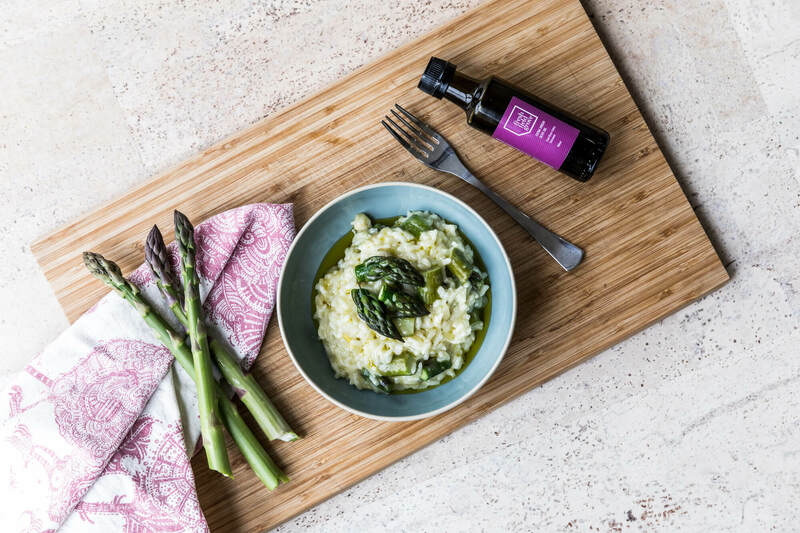 The spring flavours here are beautiful finished with a lemon olive oil, but a little extra lemon zest and a spritz of juice work well if you don’t have any. We really appreciate you taking the time to check us out. 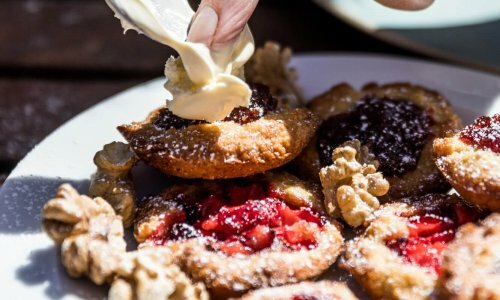 We are publishing new articles about vineyards, places to eat, stay, and explore every two weeks or so.